Blup! | The original. Beanbags for you, for your kids and pets too. Rent or get them branded! Offer them a noe petbed! Our main aim is to create loveable ready for your home furniture by harmonising shape, material and colour with functionality. After fourteen years in the beanbag business, we feel that this is not only our ambition, but the reality. We have been providing ingenious solutions for our partners over the years at interior design events, as well as for event planning, marketing and even medical projects. Bluppo! is our range designed for kids and our noé beds serve the comfort of our canine and feline friends. You can rent our beanbags for classy/formal/official conferences as well as for casual parties. Branding the cover of the beanbag makes it an excellent advertising material or an unique gift. HOW DO WE BUILD OUR BEANBAGS? 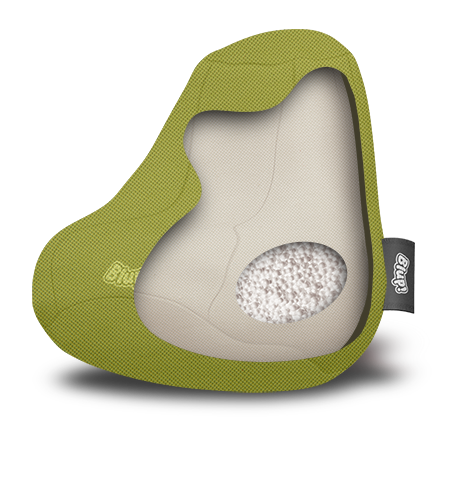 The polystyrene filling is anti-allergenic, light weight and water repellent. The surface and the shape of the beads allow them to freely glide on each other so that the shape of the beanbag changes to fit the shape of your body. Depending on the intensity of the use, the volume will reduce over time, but it can be easily refilled through the zip of the liner. The beanbag insert is made of 100% cotton canvas with the exclusive purpose of holding the filling, therefore its use without the cover is not recommended. It does not require cleaning (washing is not recommended) if it is used for its intended purpose. However, the volume of the filling can be managed through the zip of the liner. Both the cover and the liner of our beanbags are sewn with a strong seam, for which we provide 1 year guarantee against tearing. In case you experience a tear outside the warranty period, bring in the damaged item, we are still happy to help. The outer Blup! covers are available in a variety of fabrics and our primary aim is to ensure durability. We offer a wide range of covers in terms of feel and colour, from 100% cotton canvas, through easily manageable blended textiles to printable PVC fabrics. The embroidered Blup! logo and the woven label on the side make our beanbags distinctive. We provide solutions for our partners’ branding cocepts through embroidery or screen printing. If neither of these methods are suitable, the whole fabric surface (PVC) can be printed. Let it be a festival, a conference, a corporate party or just a small birthday bash with not enough seats, we can help you. 15 years is a long time, with many exciting and beautiful assignments. The screen is not big enough to list all our partners’ logos. We have provided bespoke service for countless events, ideas for numerous office and recreation interiors, promotions, or simply helped to make a Christmas gift special. We appreciate their trust in us.